Can you teach others HOW TO DO something in a fun and entertaining fashion? Can you demonstrate it in 20 or 45 minutes? Can you make it hands-on with audience participation? 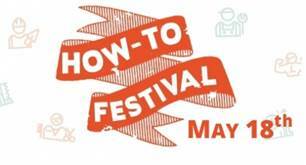 If that’s a YES from you, apply to present as a volunteer at the 4th annual How-To Festival to be held at 20 libraries on Saturday, May 18. For program ideas and inspiration, view the 2018 How-To Festival program line-up here.